Bluetooth Version: Bluetooth 4.0 supports HSP, HFP, A2DP,A VRCP format notification Sound. Bluetooth Effective Range: 10m/33ft (the distance depends on the bluetooth device and environment). 1. The color of the item may vary slightly due to photography and different PC monitor, and the size might be slightly error due to manual measurement. Your kindly understanding would be appreciated. ▶▶NEW DESIGN SOUNDBAR: This wireless Bluetooth audio stereo is a sound bar with one side is fabric and the other 3 sides are smooth and shining piano bakes lacquer. Match your home decor better. ▶▶EXCELLENT SOUND QUALITY: The Soundbar output power is 20W, 3D stereo sound, deep bass, Anti Magnetic, Anti Noise and HD chipset. 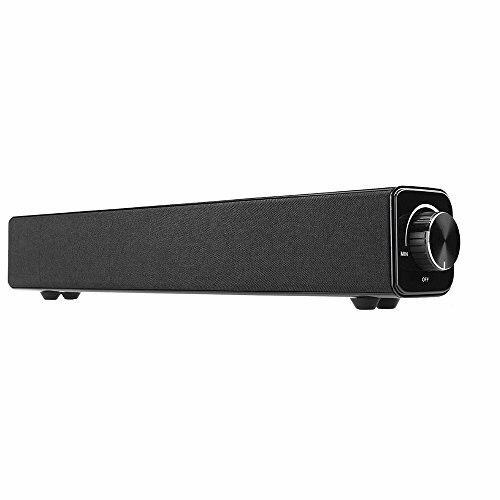 Dual high-quality speakers in the sound bar deliver surround sound reaching 85db. Noise-proof HD chipset brings out an amazing home theater experience. ▶▶FIT FOR MOST ELECTRONICS: The surround soundbar system fits for most electronic devices with audio players, including TV, pc, notebook, smartphone, tablet, MP3/MP4 and CD/DVD player. With 3.5mm line-in jack, also support external audio devices, allows you to stream music to your other devices. It also support TF Card mode, enjoy your favorite music from your TF Card. ▶▶PORTABLE AND WIDE USE: This bar shaped mini wireless speaker is light weighted and portable. You can use our speaker in living room, bedroom, kitchen, hall with clear bass sound, or you can choose this Bluetooth wireless speaker for your music party. ▶▶LONG PLAYTIME: The bar-shaped wireless Bluetooth speaker is supported with Li-Ion 4400 mAh rechargeable battery that can work about 8-10 hours of continuous playtime; recharge in 6 hours with micro USB cable.